Edel Assanti is pleased to present Jodie Carey's monumental work Untitled (Slabs). Originally commissioned by and exhibited as part of her solo exhibition at The New Art Gallery Walsall in 2012, the sculptural installation consists of seven monumental plaster slabs, intricately arranged within the gallery. 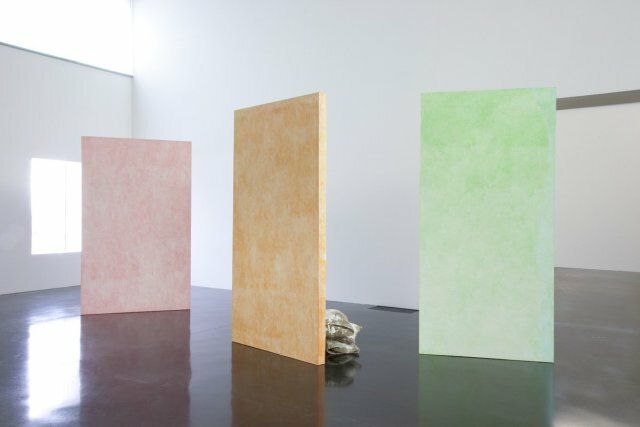 Like much of Carey's practice, the simplicity of the work belies a long, grueling process of creation: each of the slabs (mostly three metres in height) has been hand-cast by the artist, and meticulously coloured using pencil crayon, a medium chosen for its naivety and fragility. The backs of the slabs are purposely exposed to reveal hand-made hessian sand bags weighting the sculptures down. Exploring the themes of time, memory and materiality, the immersive installation is a monument to its own fragility and vulnerability, subverting the ritualistic traditions of commemoration that mark contemporary western attitudes to mortality. Jodie Carey studied Fine Art at Goldsmiths College, completing an MA in Sculpture at the Royal College of Art in 2007. Carey's work features in prominent UK collections, including the Saatchi Collection, the David Roberts Collection, as well as Swiss gallerists Hauser and Wirth. Recent solo exhibitions include Solomon's Knot at The New Art Gallery Walsall (2012), Somewhere, Nowhere at Pump House Gallery, London (2011), In The Eyes of Others at the Towner Contemporary Art Museum, Eastbourne (2009), and Still, Life, at Alexia Goethe Gallery, London (2008).